Peel and dice your mangoes, then add to your blender. Add the coconut yogurt and vanilla and blend until smooth. The amount of maple syrup you need to add will depend on the ripeness and sweetness of your mangoes, as well as your sweet tooth, so taste beforehand. Stir or blend through the mixture. Once you’ve finished blending, add the chia seeds and stir through until well incorporated, then spoon the mixture into serving bowls and place in the fridge overnight. 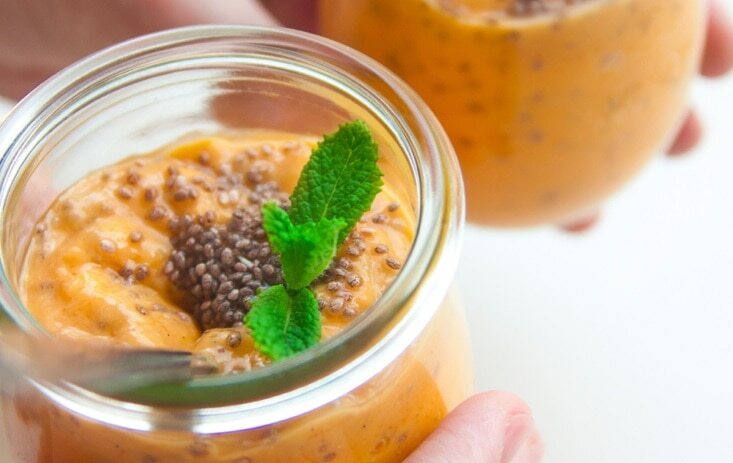 This allows the chia seeds to absorb some of the liquid, creating a mousse-like consistency. Serve the next day, with a sprinkling of your preferred toppings.